TSA shut down Newark over a Goodbye kiss! 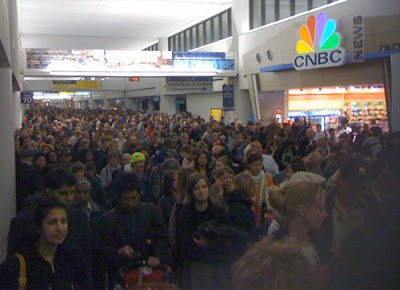 NEW YORK (Reuters) - The security scare that shut Newark airport for hours and delayed thousands of passengers was caused by a man who slipped into a secure area to give a woman one last goodbye kiss, a newspaper reported on Thursday. A videotape of the Newark incident shows the man embracing a woman at the C-1 security checkpoint before she passes through passenger screening, the Star-Ledger newspaper of New Jersey said, citing unnamed security officials who have viewed the tape. The man, who was not a passenger, walks past a spot where a Transportation Security Administration (TSA) officer should have been stationed to move closer to the woman, the paper said. In other big news, Megan Fox's vinegar cleansing diet is slammed by health professionals. I guess health professionals want their vinegar wrapped up in a douche! So that's the spit and vinegar story--and now David Stern wants to show the world he has spit in his balls! 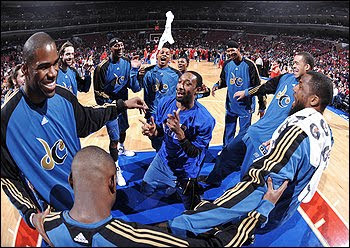 Remind me again, why Gilbert Arenas got suspended indefinitely by the NBA? Because of this picture! He's making a gun with his fingers! Ha! Screw you David Stern! And to wrap it up---Can you imagine what the TSA would of done to him, if he was flying? They would of told him to kiss off!